The completion of the £3.8m distillery project in Dingwall, which began in 2015, brings whisky distilling back to the area for the first time in 90 years, and will be marked by an opening ceremony attended by thousands of GlenWyvis’ shareholders. More than 3,000 people from the local area and beyond own a stake in the distillery, each investing from as little as £10 up to £100,000. Following its official opening, GlenWyvis expects to begin distilling by the end of the year, producing a ‘green, grassy’ style of whisky, matured predominantly in American oak casks. Spearheaded by retired Army officer and helicopter pilot John McKenzie, who assumes the role of managing director and founder, GlenWyvis has been financed almost entirely through crowdfunding. McKenzie said: ‘I’d like to think of us in the future as being the Brewdog of the distilling world. The difference is that no single person or small group will benefit from it. ‘The risk is spread currently among over 3,000 people, and the reward will be spread as well. GlenWyvis marks the return of malt whisky production to Dingwall following the closure of the original Ben Wyvis distillery and nearby Glenskiach in 1926 – distilleries that inspired the GlenWyvis name. Also situated nearby was the famed Ferintosh distillery, the closure of which in 1785 was lamented by Robert Burns in his poem, Scotch Drink. GlenWyvis distillery has the capacity to produce 140,000 litres of pure alcohol a year, all of which will be matured on-site and made using locally-sourced barley from the Highland Grain co-operative. Former Mortlach distiller Duncan Tait, one of GlenWyvis’ original investors, joined the project last week as master distiller. As well as overseeing the distillery’s whisky production, Tait will also manage the production of GlenWyvis gin, currently being made at Unst’s Saxa Vord distillery, but which will be brought in-house in early 2018. 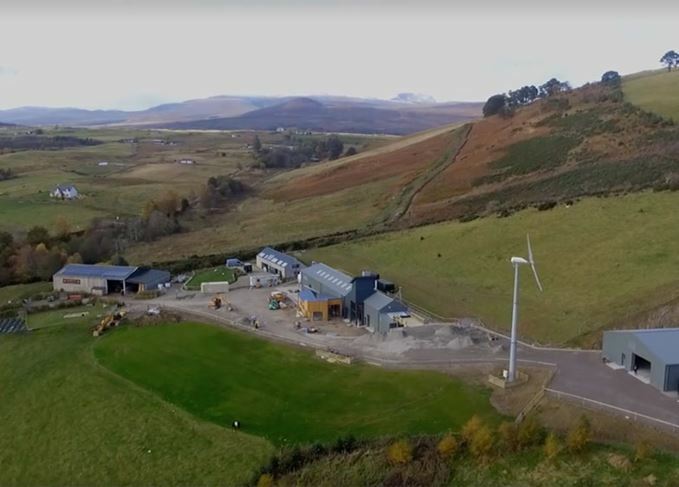 GlenWyvis will be powered by 100% renewable energy from an on-site wind turbine, hydro-electric scheme and solar panels, while a woodchip-fuelled boiler will provide steam for the stills. The distillery also uses an electric car and is considering the purchase of an electric bus to provide tours to the site’s expected 10,000 visitors a year. Discover more about GlenWyvis distillery’s whisky and history. Limited edition single malt Highland Inspiration marks start of distillery building.